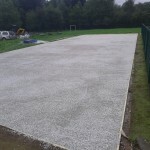 We have carried out athletics track construction work for numerous sports facilities at schools, leisure centres and professional clubs in the UK. 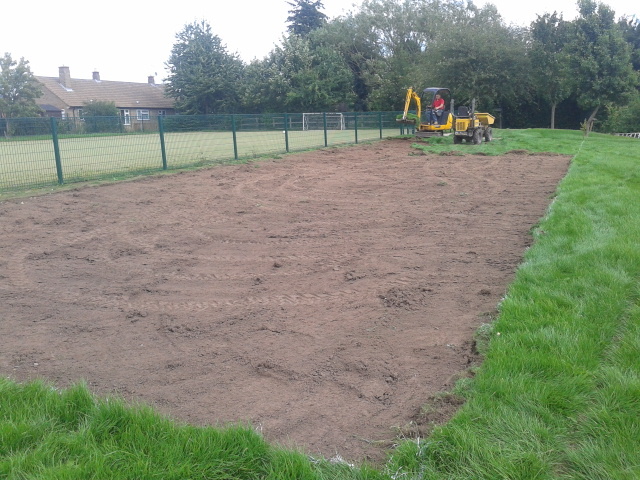 This can be done using a number of surface types, depending on who is going to use the area and how regularly. The installation process varies for every project, but we’ll always try to make it as simple as possible for the client. Please contact our team today to discuss costs for installing a new athletics facility. You can fill in the quick enquiry form on this page with details of the project and we’ll get back to you as soon as we can with a quote. Be sure to include as much information as possible such as your budget, location, area size for the work, and the current site conditions. 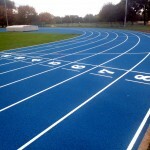 Athletics track construction can take place at a number of organisations such as schools and leisure centres, and can include the installation of running tracks, long jump/triple jump runways and high jump fans. These surfaces can be constructed from either polymeric EPDM rubber crumb or needlepunch synthetic turf surfacing. The type of flooring you choose will depend on how the area is going to be used. For recreational facilities, we would recommend the synthetic turf, but for professional standard tracks the rubber surfacing is more suitable. 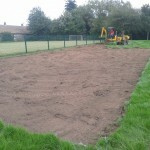 The athletic surface construction process begins with excavation of the existing ground to the required depth, next a geotextile membrane is put down to prevent plants and weeds growing up through the surface. 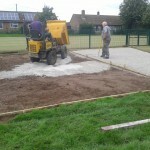 Once these groundwork preparations have been done, a stone sub base is installed on top, this specialist sports sub base is perfect for use in running track installation because the gaps between the stones make it porous for water to drain away easily. Next, a macadam base layer is applied to the stone to give an even finish for the foundations for the track or runway and to prepare for the installation of the athletics surfacing itself. Once the base layers have been installed for the athletics track construction, the chosen surfacing specification is applied to create the runway itself. This will be applied in either polymeric rubber or fibre bonded needlepunch surfacing, depending on the requirements of your project. 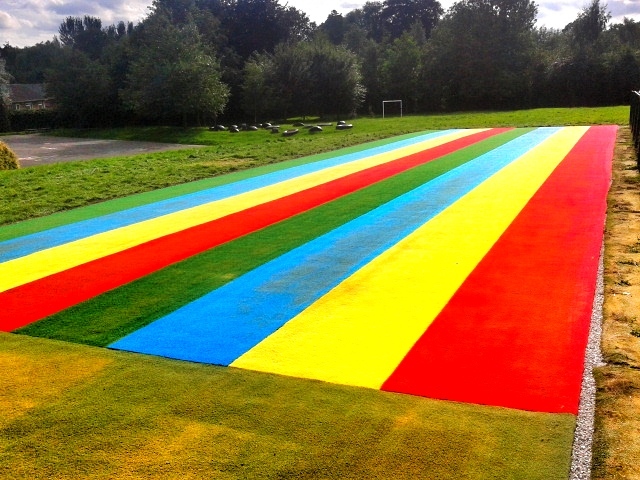 Both of these individual surface types can be used for a number of athletics facilities including running tracks, long jump runways and high jump areas. We can provide designs for each of these facilities if you are looking to have different components for your outdoor sports area. 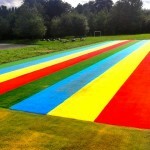 The fibre bonded synthetic turf athletics track construction is more popular with primary schools as it provides a softer surface for younger children who are using the sport facility. This helps to prevent injury during PE lessons and after school sports clubs which younger children might be attending. Polymeric EPDM rubber surfacing is usually installed for more professional athletes and older children at athletics clubs and high schools as it is more appropriate for competitive sports events. It’s also important to regularly maintain your needlepunch surface and ensure it’s kept safe for use, more details on the cleaning methods for this surface type can be found if you click here. 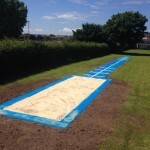 Extra accessories can also be provided along with the full athletic track installation, these include take off boards, sand pit covers and maintenance equipment to ensure that your athletic facility is kept in the best condition for as long as possible. Once the facility has been built, it’s important to use the correct equipment to make sure you are getting the most out of it and that users are safe. We can tailor your construction project to your individual requirements to make sure you get the facility you want but to also ensure the project stays within your budget. Additional features and accessories come in a number of specifications and designs so these can also be customised to suit any requirements you have. 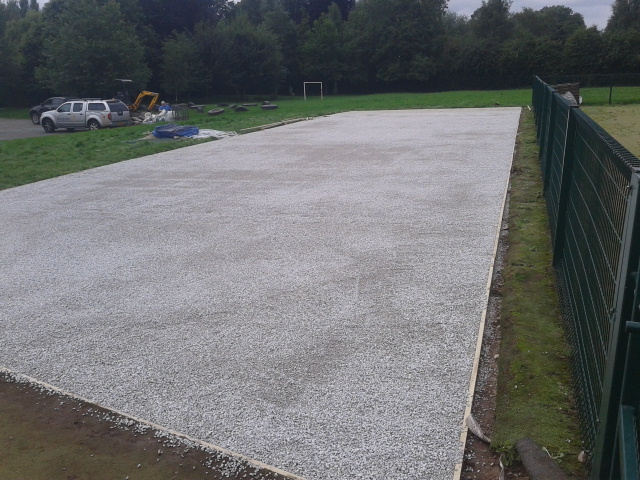 If you need any more information about athletics track construction or specifications, have a look around the rest of our website and don’t hesitate to fill in our contact form if you’d like to send us an enquiry or discuss prices and quotes. 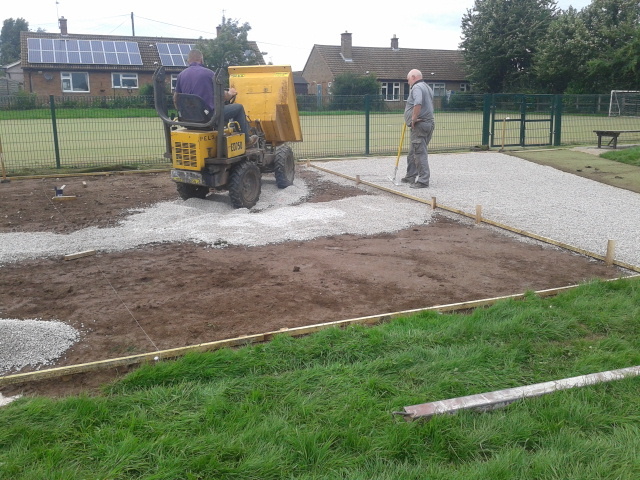 We have worked at many schools and sports clubs throughout the UK so we have plenty of experience with installing these sports surfaces. Please feel free to ask us any questions and we’ll send over all the information you need as soon as possible. 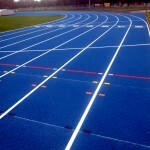 Are Athletics Running Tracks Always Red? The Difference Between an Athletics Track and a Running Track?